This movie is absolutely brilliant. I loved it when it came out, I loved it in subsequent rewatches, and I still love it. Why? Because it is put together extremely well, the cast carrying this show is fantastic, and it looks amazing. There is really just too much to love about this and not anything to seriously complain about. Jake Gyllenhaal never disappoints (seriously bestie, you must watch more of his work) and his Robert Graysmith is really interesting to watch, like a dog with a bone. Robert Downey Jr. is excellent as prick crime reporter Paul Avery, and showcases how he really has more talent than just Tony Stark/Iron Man. I really miss when he used to take real other roles. The final big player here is Mark Ruffalo, and I always enjoy watching the man in anything. His detective character David Toschi is also a big draw, and I really like how these three characters each had their own obsession, they all danced around one another, were all similar but completely different. I think the movie really runs home the point of obsession, and how it interacts with everyday life, which is very interesting. Not only that, the movie is obviously shot phenomenally because, well, David Fincher. The script it also tight, laying out all the pieces of evidence you need in the case of the terrifying Zodiac killer, who freaked people out beyond anything, even though he was never caught. I think that Robert Graysmith did a great job of investigating and seriously has the strongest case stacked against Arthur Leigh Allen. 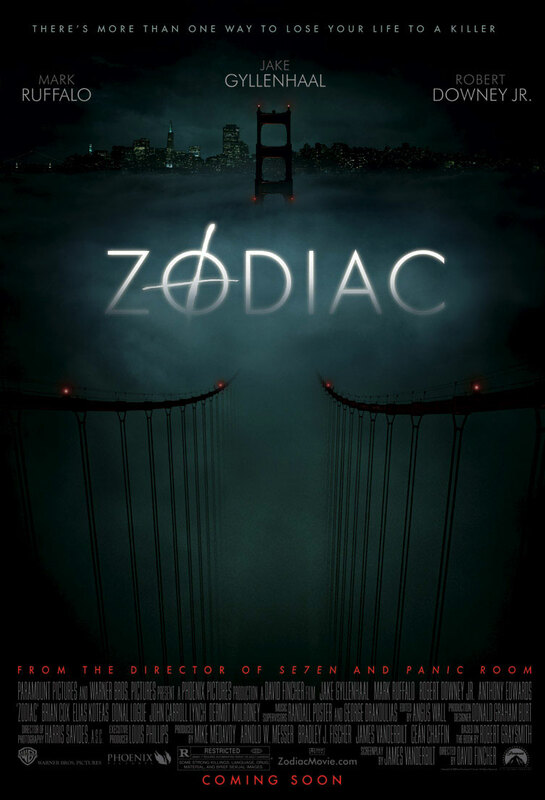 Zodiac is engrossing and mesmerising and demands your attention throughout, and barrels along at such a pace that you are not left behind, but are gripped, and does not allow your attention to wander for even a moment. You cannot miss that immense amounts of work, interest and passions that went into the film, everything from costume design to the sets that were done, and reading up on the trivia for it, all this is confirmed. I have not read Graysmith’s book, but I will most certainly be looking into it as soon as possible. If you have not seen Zodiac, it is high time you rectify that.